Chuck Searcy enlisted in the U.S. Army from 1966 to 1969. Assigned to the 519th Military Intelligence Battalion in Saigon from June, 1967 to June,1968, he served as an intelligence analyst at the Combined Intelligence Center, Vietnam (CICV). After military duty he returned to the University of Georgia as a student and became active in the Vietnam Veterans Against the War (VVAW). Searcy was editor and publisher of a weekly newspaper for 12 years, worked in Washington in President Jimmy Carter’s administration and later for U.S. Senator Wyche Fowler. 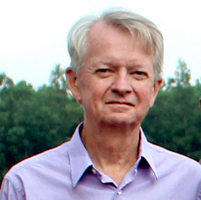 He was Executive Director of the Georgia Trial Lawyers Association from 1989 until 1995 when he moved to Vietnam as representative of the Vietnam Veterans of America Foundation (VVAF). In 2001 Searcy became representative of the Vietnam Veterans Memorial Fund (VVMF) and helped launch Project RENEW in Quang Tri Province, to clean up unexploded ordnance and provide medical assistance, rehabilitation, and income generation for UXO victims. Project RENEW’s mission also includes support for Agent Orange victim families. Searcy is co-chair of the NGO Agent Orange Working Group in Vietnam. He is a co-founder and currently vice president of Chapter 160 of Veterans For Peace, based in Viet Nam. In 2003 Searcy was awarded Vietnam’s National Friendship Medal.